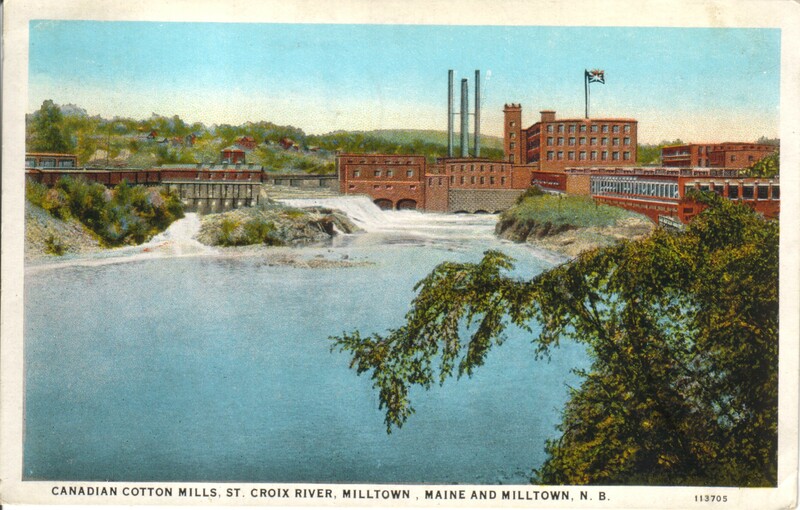 For thousands of years the Passamaquoddies spent much of the summer encamped at Salmon Falls, Milltown just below Knight’s Corner. Not only was the Falls sacred to the tribe and, on the Canadian side, a burial ground but when the salmon were running it was time to feast on the bounty of nature.Historian Ned Lamb wrote the article below for the Calais Advertiser in the early 1950’s. 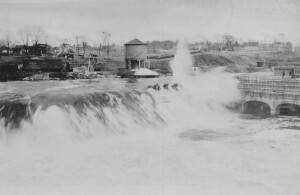 We wish we had a better photo of the Falls before the Cotton Mill and its dams but by the advent of photography the water power of the falls was being converted to power for the Cotton Mills. 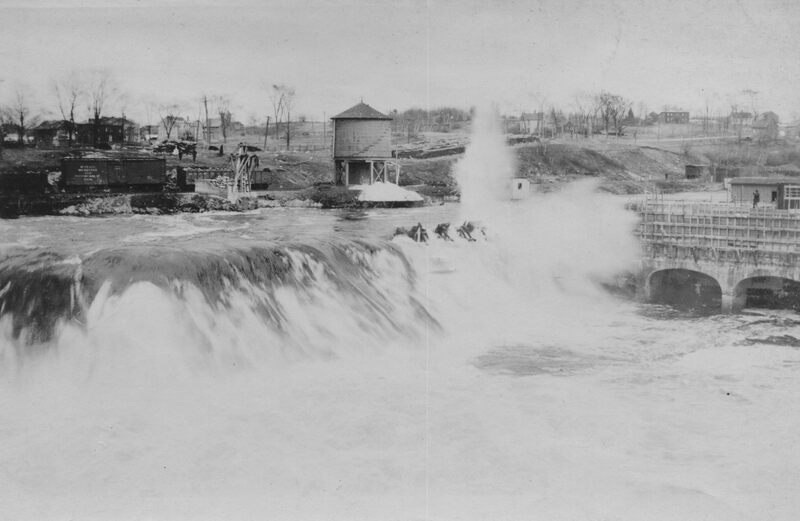 The photos below however shows Falls before the larger dam was built and gives the reader some idea of what Salmon Falls was like in earlier times. 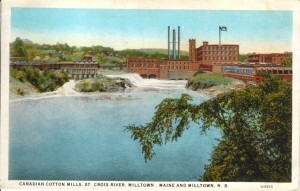 To the background is Knight’s Corner on the US side and the rail yard and water tower for the Maine Central Railroad’s Salmon Falls station. It is practically impossible for us to comprehend a civilization without metals. Iron, especially, has been so long in our idea of living that we cannot see how people got along without it, but they did. The In­dians were so quick to adopt some of the white man’s things that we almost think of them as always having them. These included knives, hatchets,. (tomahawks) and blankets. The French tomahawks were made by wrapping a flat piece of iron around a hole and they pounded the two edges together until they were about one piece. Then the edge was tempered. Champlain speaks of our beautiful river as “the river of the Etechemins”. He also called it the St. Croix. He knew from the India­ns the river went to the north and west and thought that it was just i a carry to another where the mythical city of Norumbega was located. When he had ascended the Penob­scot as far a Bangor and found only a few huts, Norumbega was quickly moved west into New York, or some other place. 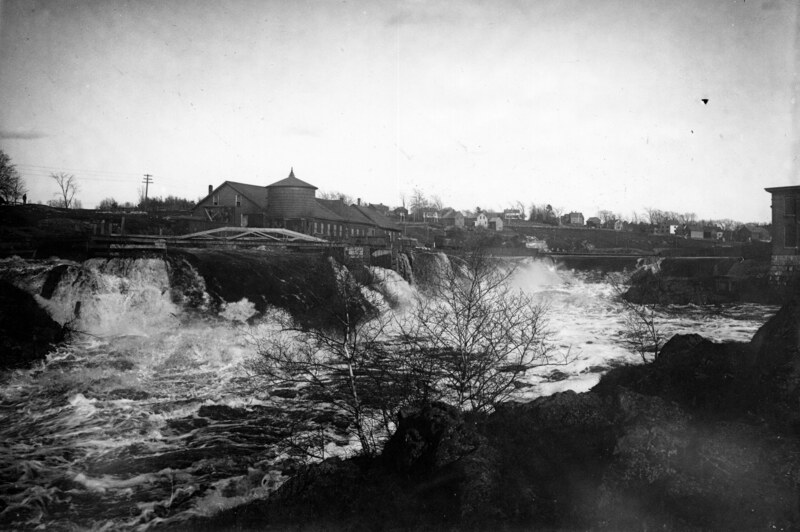 Champlain tells about what we used to call our Salmon Falls and how the natives went there to get the fish. He also said they, the French, planted wheat there and that it flourished well and gave promise of a good crop. The Etechemins came there when there was a run of fish and camped on what we call the Canadian side. There was the slope that went up to the higher place and made a good. chance for their huts. It is that when a cellar was dug near there that bones of buried Indians were found. The river was literally full of salmon, crowding each other to get over the falls to the spawning grounds in the lakes above. These Indians had no hooks and lines. The fact is that these Salmon would not take the hook or feed in their eagerness to get up the river. Ant here was a lively scene. Naked men, women and children lined the bank and if then was a chance to reach in and get a fish it was quickly thrown on the bank. When the tide went down the older ones could get into the pools with spears and clubs and the real fishing began. It was a pleasant time for the tribe. There would be plenty to eat for a time. We believe that their spears were sharpened sticks for they would not take a chance of breaking the fragile stone spearheads when they could get the fish without them. Some may have used canoes and fished from them. Then came the eating. The Etechemins were not a silent people. If a man happened to slip or step in­to a deep hole while fishing and went under, he got “the merry ha ha” just the same as among white people. If a large fish was speared it was admired just the same as now. Around the fires were merry times as the women cooked the salmon. They had no cooking pots so they had to roast the fish. The Indians were not fastidious feeders. Very little of the fish was thrown away –­very little! The Indians around here had to be hunters and there were not many of them, and they had to roam over a large territory to get their food and when they got any they made the most of it. But here on the banks of the St. Croix was a merry time. Food was plentiful for awhile and that was enough for the Indians. Perhaps if they moved up to Grand Falls for a repeat Perhaps some went down to Porter Mill Stream and picked up some Gaspereaus for a change. They had to go from place to place where ­ever they thought there was some­thing to eat and tribal memories told them where to come. How big were these salmon perhaps ten or twelve pounds on the average. Of course some went more and some went less. Then came the white men!